I was going crazy for the Prada butterfly glasses last year, but it's 2009 now and for some reason I'm still alternating between rosy aviators and tortoiseshell bug eyes, among other cheapy sunglass purchases and a pair of chanels that i sense are too cool for me. 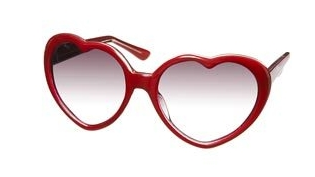 I'm kinda hoping to pass over the whole Wayfarers thing, since I feel like there's a new trend waiting to arrive (though I'm not entirely sure what that is, or if I will choose to hop on that bandwagon), and what I really really want is a pair of heart-shaped sunnies. To go along with jellies, perhaps -- another nostalgic, retro-flashback item that has been on my mind ever since I twittered about jelly bellies and a follower got confused and asked me about jellies (probably because of my username). Although, I'm wondering if plastic/rubber shoes in the summer will give you crazy blisters.